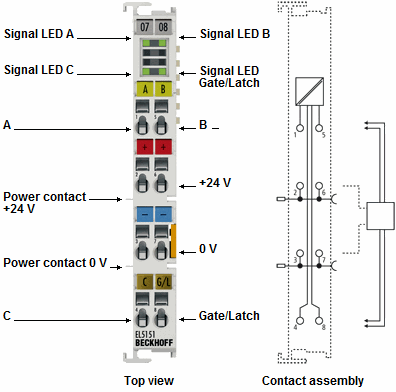 The EL5151/EL5152 EtherCAT Terminal is an interface with 24 V inputs for the direct connection of incremental encoders. With the EL5151, a 32 bit counter with a quadrature decoder and a 32 bit latch for the zero pulse can be read, set or enabled. Alternatively, the EL5151 can be used as up/down counter terminal with gate. 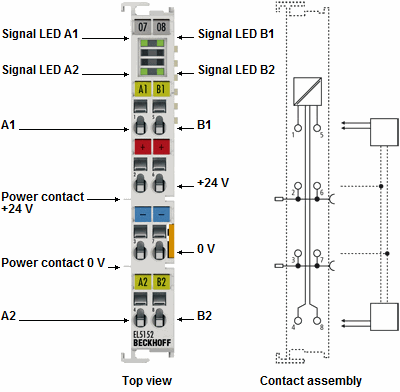 With the EL5152, two 32 bit counters with quadrature decoder can be read and set. The EL515x supports the synchronous reading of the encoder value, together with other input data, into the EtherCAT system via high-precision EtherCAT distributed clocks (DC).